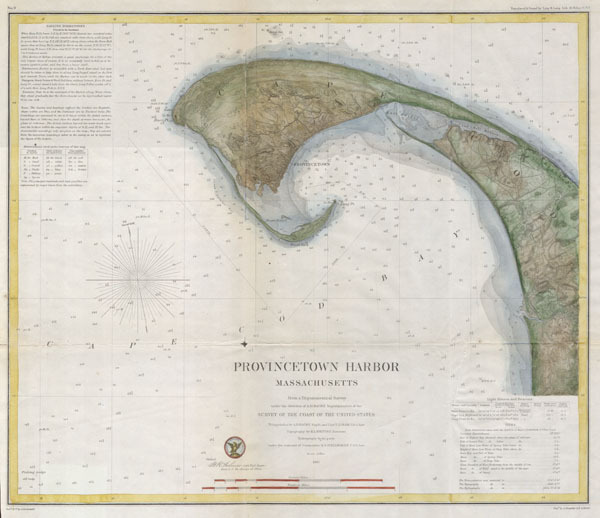 A rare hand colored 1857 costal chart of Provincetown, at the tip of Cape Cod, in Massachusetts. Offers a wealth of information with regard to both the region's hydrography and its topography. Locates the Salt Marsh & the Highlands; marshes, low scrub areas; paths & dirt roads on the land leading to Provincetown itself. Numerous depth soundings. Sailing notes and references to lighthouses in the upper left quadrant. The topography was accomplished by H. L. Whiting and the Hydrography by H. S. Stellwagen.. Published under the supervision of A. D. Bache for the 1857 Report of the Superintendant of the U.S. Coast Survey. Good condition. Blank on verso. Good margins. Minor discoloration on original fold lines. Verso repair to center just above the “R” in “Provincetown Harbor”.